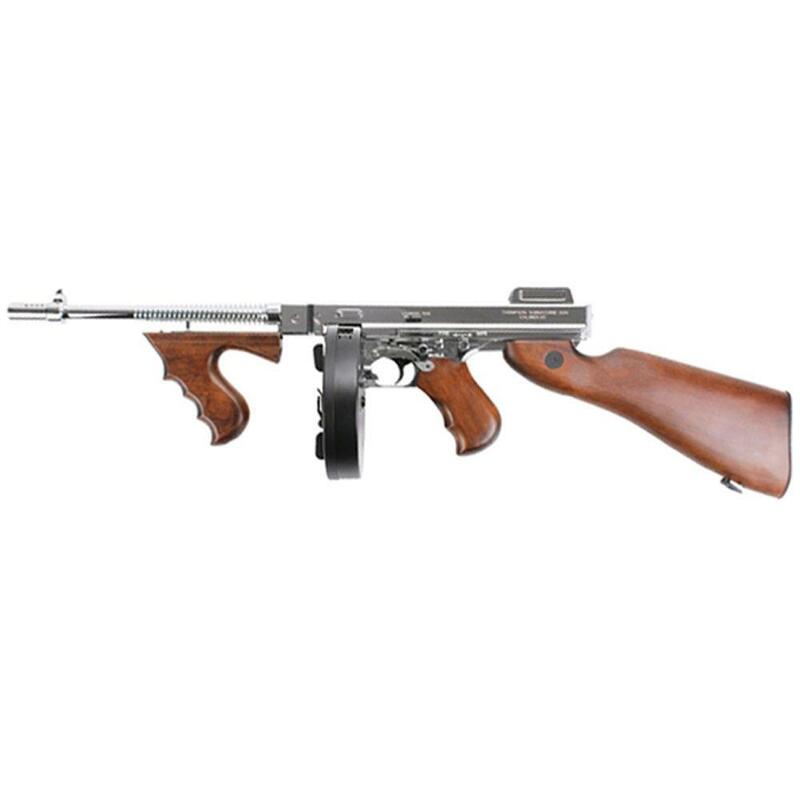 Buy Cheap PALKAAG67SV King Arms M1928 Silver Thompson HI Grade Airsoft Rifle| ReplicaAirguns.ca | New Website! Comments: This Silver Plated version from M1928 gangster King Arms is nicer in every detail. Better trademarks and better accuracy! The King Arms Thompson 1928 "Chicago Typewriter" is a replica of the .45 caliber sub-machine gun produced by the Auto-Ordnance Company during roaring twenties and on through the Prohibition era. Designed for full auto mayhem, this rifle features a faux wood stock, motor grip, and foregrip. The upper and lower receiver are historically accurate metal with the unique safety and selector switches only found on the M1A1. The sturdy magazine release is one-of-a-kind and operated as a lever instead of as a button. The magazine included is the drum style high capacity variant that 450 BBs. Extended length high capacity stick magazines that can hold up to 420 BBs can be found on our AEG magazine page. The battery compartment is located in the stock. To access the compartment simply lift up the circular tab located on the buttplate, then lift and rotate the plate itself up and out of the way for installation. Then just reverse order and the battery has been installed. And if you "have to" upgrade the gearbox because stock is just too slow for you, Version 6 gearboxes are among the easiest to work on, so never fear! The only thing not historically accurate about this gun is the bolt which on the side like the military model and not on the top like the Typewriter actually had. For the die hard 1920's Gangster fanatic, this is the rifle for you!